There is no better way to make the most out of your beautifully landscaped backyard than by adding an outdoor living space. Similar to how a custom swimming pool adds elegance and sophistication to your backyard, an outdoor living space is a wonderful addition that is ideal for both relaxing and entertaining. From building the space out to include a stunning kitchen to keeping it simple and creating a lounging space you can enjoy year-round, there are many different options when it comes to customizing your outdoor living area. Many people look at the backyard as an extension of your home, providing you with additional space to relax and entertain. With this in mind, it is no wonder why outdoor living areas have become so popular in recent years. The beauty with this whole idea of a customized outdoor living space? You can truly make it yours. 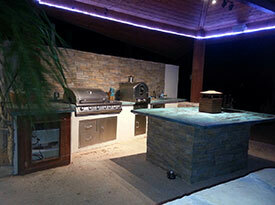 Whether you are a whiz in the kitchen and are in the market for a high-end outdoor cooking space where you can impress your loved ones night after night, or are more in the market for an inviting, comfortable, and luxurious space where you can put your feet up, relax, unwind and enjoy your Oasis. Not sure about adding a custom outdoor living space to your home, pick up the phone and give Oasis Pools & Spas a call today. 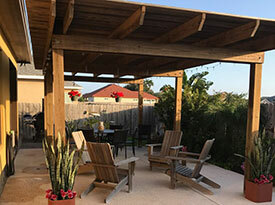 We are happy to walk your land and determine what type of outdoor living space will work best for your backyard. If you already have a pool and spa, or are considering adding those at the same time, we can work with you to ensure you are happy with your choice. We understand how important your home is to you, and your backyard is no different. Creating a unique, modern, and sophisticated outdoor living space is something we are experts at, so give us a call today and let us get started on the outdoor space of your dreams.